I had managed to do some dieting a few months ago as I think I need to do something before I am synonymous with the word 'FAT' and my health deteriorate. I managed to do it with a diet which did not even left me feeling hungry at all and allows me to eat almost everything. It was the best decision I ever did and I even have to buy new clothes to allow me to look like not as if I am borrowing some hand-me-down clothing. Then the usual culprit which makes diet goes awry came. The season to be jolly, Malaysia style. Eid Mubarak celebration which has to be celebrated for 1 month. With it comes the open houses and the food. 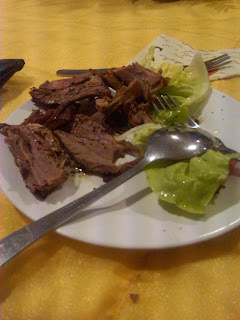 I ask you, if you love grilled lamb and nearly all the houses have it, wouldn't you at least have even a small piece. That is until that satay and that briyani rice to seem to call your name as you are passing them. I think I would fail too. That food looks too good. I'd have to eat it.